by Legacies Old & New, Inc.
Email: Legacies Old & New, Inc.
Over 300 lots, Gold Coins, Silver Coins, Paper Currency, and Mint Dies. Auction will start at 3:00 p.m.
Auction House will ship at Buyer's expense. Most items will be insured. In the event of an item arriving damaged please note that this auction house does not reimburse postage. Description: 1986-S One Ounce Silver American Eagle Liberty Coin Proof. Comes with Original Paperwork. Lot O. Description: 1917 Spellman White Small Red Seal Large One Dollar Bill Fine. Lot A. Description: 1838 Large Cent VG-8 Or Better. Lot B. Description: 1874/1875 Ten Cent Fractional Currency Meredith Green Seal. Fine Condition. Lot O. Description: 1878CC Carson City Morgan Silver Dollar Coin. VF-20. Lot A. Description: 1913 Barber Or Liberty Head Dime NTC Rated AU-53. Lot A. Description: Rare 1803 Large Date Small Fraction Draped Bust Large Cent. G-4. Lot B. 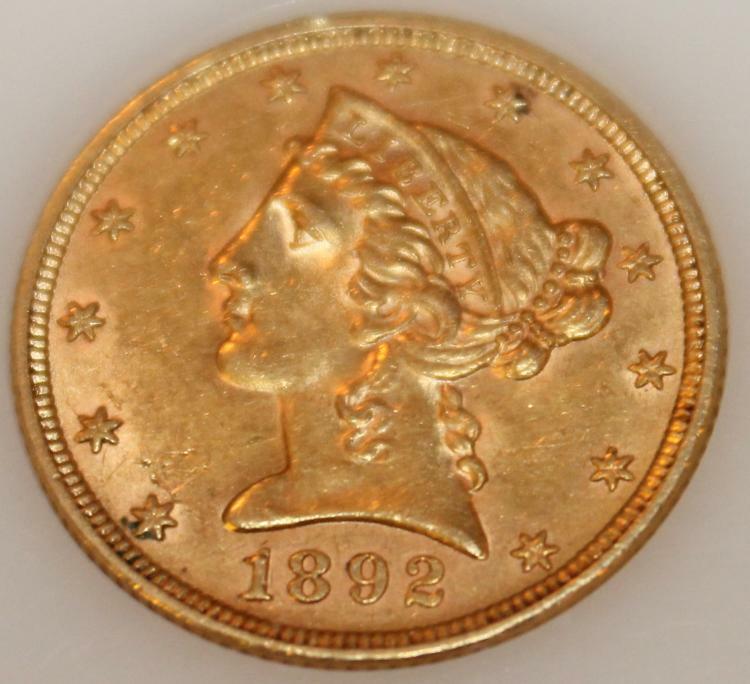 Description: 1892 Gold Half Eagle Five Dollar Coin AU-50 Or Better. Lot O. Description: 1854 Seated Liberty Variety 3 Half Dollar Coin EF-40. Lot A. Description: 1894 Morgan Silver Dollar Coin EF-40 Or Better. Lot B. Description: 1874 Fractional Currency Twenty Five Cent Walker Note. Fine. Lot O. Description: 1940 Washington Quarter NGC Rated MS-66. Lot A. Description: 1875-S Seated Liberty Twenty Five Cent Piece G-4. Lot B. Description: 1929 Type 2 Jones Woods Ten Dollar national Currency New York Bill Very Good Condition. Lot O. Description: 1814 Capped Bust Half Dollar Coin VF-20 Or Better. Lot A. Description: 1854 Seated Liberty Quarter Dollar Coin F-12 Or Better. Lot B. Description: 1832 Capped Bust Half Dollar Coin F-12 Or Better. Lot O. Description: 1939 Ten Cent Mercury Coin WCG Rated MS-65. Lot A. Description: 1911 Indian Head Gold Half Eagle Five Dollar Coin EF-40 Or Better. Lot B. Description: 1925 Stone Mountain Memorial Commemorative Silver Coin MS-60. Lot O. Description: 1889 Morgan Silver Dollar Coin AU-50 Or Better. Lot A. Description: 1856 Seated Liberty Half Dime Coin G-4 Or Better. Lot B. Description: 1921-S Morgan Silver Dollar Coin AU-50 Or Better. Lot O. Description: 1852 Silver Three Cent Piece Trime VG-8 Or Better. Lot A.